Thank you for reading my blog yesterday and for the outpouring of support for my daughter. She had a very good day yesterday and we are looking forward to another great one today. I was always curious about how Layla came together. So I thought I would do a little research to understand three questions about Layla? How did Duane Allman get involved? How did Jim Gordon’s piano piece become part of the song? According to Boyd, Clapton played the song for her at a party, and later that same evening confessed to George that he was in love with his wife. The revelation caused no small upset among the three of them, but Pattie and George remained married for several more years, and Harrison and Clapton retained their close friendship with no apparent signs of damage. Boyd divorced Harrison in 1974 and married Clapton in 1979 during a concert stop in Tucson, Arizona. Harrison was not bitter about the divorce and attended Clapton’s wedding party with Ringo Starr and Paul McCartney. During their relationship, Clapton wrote another love ballad for Pattie called “Wonderful Tonight” (1977). Clapton and Boyd divorced in 1989 after several years of separation. I’m going to quote from a Duane Allman biography here about his joining the band…. 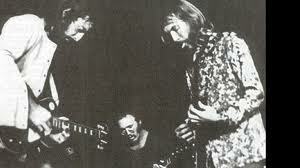 A serendipitous event put guitar greats Eric Clapton and Duane Allman in contact shortly after the Dominos had begun to record at Criterion Studios in Miami, Florida, in August of 1970. Veteran producer Tom Dowd was behind the mixing board for the Allman Brothers second album, Idlewild South, when a phone call had come in indicating Clapton was bringing the Dominos to Miami to record. On hearing this Allman indicated he’d love to come by and watch, if it would be OK with Clapton. A week or so after the Dominos arrived Allman called Dowd to let him know his band was in town to perform a benefit concert on the 26th. When Clapton learned of this from Dowd he insisted on going to see their show, saying, “You mean that guy who plays on the back of (Wilson Pickett’s) ‘Hey Jude’?…I want to see him play…Let’s go.” Clapton and company managed to sit in front of the barricade separating the audience from the stage. When they sat down, Allman was playing a solo. When he turned around and opened his eyes and saw Clapton, he froze. Dickey Betts, the Allmans’ other lead guitarist, took up where Duane left off, but when he followed Allman’s eyes to Clapton, he had to turn his back to keep from freezing himself. Clapton originally wrote “Layla” as a ballad, with lyrics describing his unrequited love for Pattie Boyd, but the song became a “rocker” when Allman reportedly helped compose the song’s signature riff. 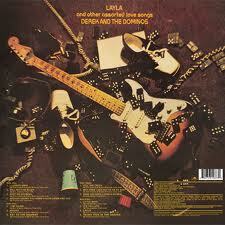 With the band assembled and Dowd producing, “Layla” was recorded in its original form. The recording consisted of six guitar tracks: a rhythm track by Clapton, three tracks of harmonies played by Clapton against the main riff, a track of slide guitar by Allman, and one track with both Allman and Clapton playing duplicate solos. Shortly afterward, Clapton returned to the studio, where he heard Gordon playing a piano piece he had composed separately. Clapton, impressed by the piece, convinced Gordon to allow it to be used as part of the song. “Layla’s” second movement was recorded roughly a week after the first, with Gordon playing his piano part, Clapton playing acoustic guitar and slide guitar, and Allman playing electric and bottleneck slide guitar.After Dowd spliced the two movements together, “Layla” was complete. So there you have it. A little deeper understanding of one of the greatest songs of all time. Now, go to your iPod, iPhone or whatever holds your music, scroll to Layla and crank it up. Enjoy! 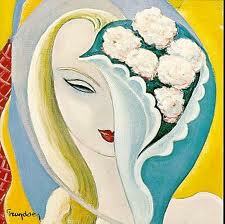 Steve, I remember the first time I heard Layla. It was on my friend’s brother’s Fisher reel-to-reel. I was sitting on the floor and I was just blown away. We listened to the whole album over and over for about 6 hours. Til this day, it’s still one of my favorite songs and favorite albums. Webman……when are you and I and Armand getting together ? We do not know when our number is up. I’m retired. Name the date and place and I’ll be there.